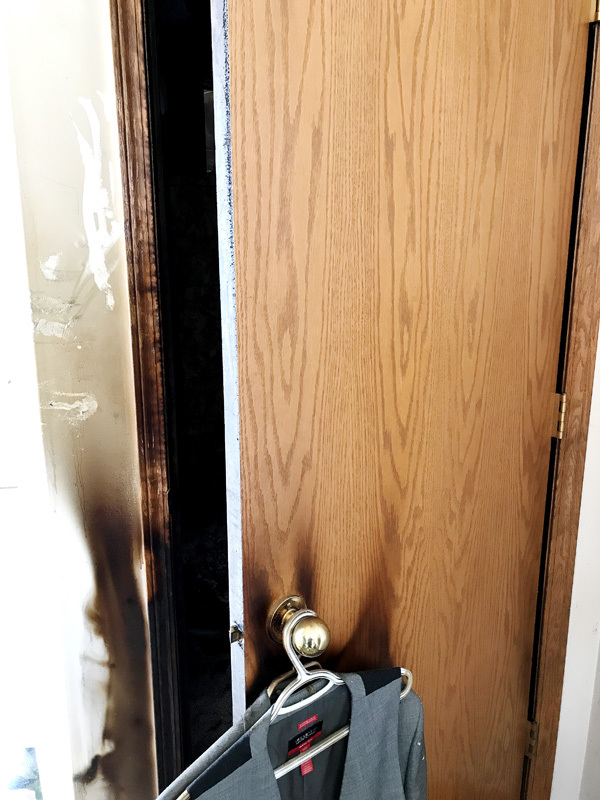 After a devastating electrical fire gutted her lakeside home on June 7, Yvette Wagner is spreading the fire safety message to close interior doors in the hopes it can prevent a tragedy from happening to somebody else. Wagner and her family had gone out but because the family dog, Maggie, liked to eat socks, they would keep all the bedroom doors closed when they went out. “If we didn’t close our doors, Maggie, [socks] can get stuck in her, it was a health risk with her. “So we were religious about closing our bedroom doors so we didn’t have our dog choking on socks,” said Wagner. When the fire started, those closed doors slowed the spread so that while the house was gutted, some of Wagner’s most precious possessions were kept safe. She estimates about 85 per cent of her photos and memorabilia of her kids growing up was in that garage. “To me it’s just a miracle that the garage didn’t go, I mean it’s all smoke damaged but that’s ok it’s still there,” she said. Fire investigators said that the fire likely started from an electrical fault in the wiring in the cooktop in the kitchen. From there the fire slowly spread through the wall into the grand piano before burning up into Wagner’s son’s room on the second floor. Wagner said that she was told that the fire was likely smoldering in her home for at least an hour and a half before a couple boating on the lake noticed smoke pouring out of a window and called the fire department. 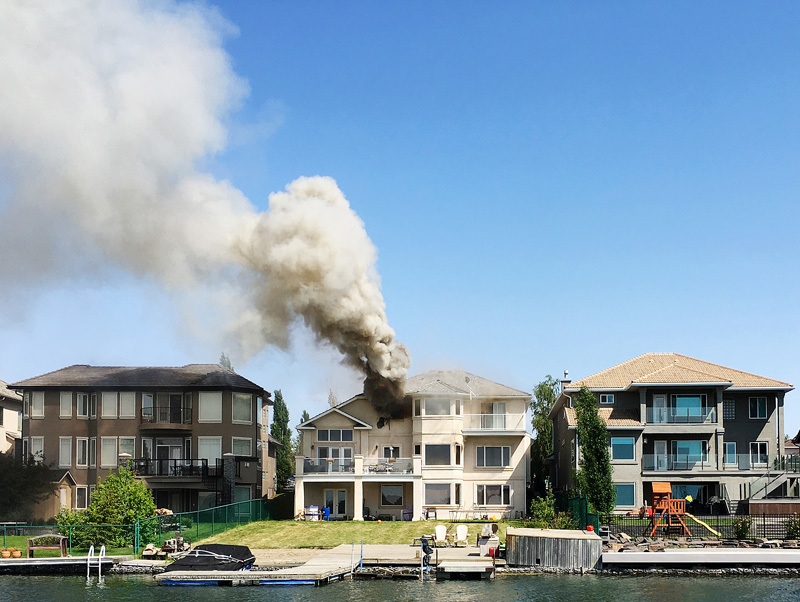 By the time the window in her son’s room burst and the fire started to get a good supply of oxygen, Chestermere Fire Services (CFS) was on scene with backup crews on their way. With the first 15 minutes of a fire being critical for fire crews to be able to assess the situation, plan their attack on the fire, execute a rescue if necessary and react to changing conditions, it’s amazing that there is anything still standing let alone an intact shell of a house given how long the fire burned. Instead of the multiple house fire it could have been, the closed doors slowed the spread and created as good and outcome as can be hoped for in a fire. And, while the closed doors bought the time to save Wagner’s photos and scrap books, tragically the reason for those closed doors didn’t survive. Maggie the family dog succumbed to the smoke from the fire. “She just fell asleep…we all hugged her good bye,” said Wagner. In telling her story, Wagner hopes that it will convince people to keep interior doors closed and perhaps prevent a tragedy happening to someone else. “The closed door buys you time,” said Wagner. They were also met with the sound of all the smoke and carbon monoxide detectors going off. “Every alarm was going…so I think if we had been home in the middle of the night we probably would have been woken up,” said Wagner. Along with the time to react to the alarms, had someone been home, the closed doors would have protected them from the flames. “Every bedroom upstairs in our house, every door was black, every door jamb was black the walls the ceiling everything was black,” she said. “And on the other side of those doors was an [unburnt] honey oak door,” said Wagner. 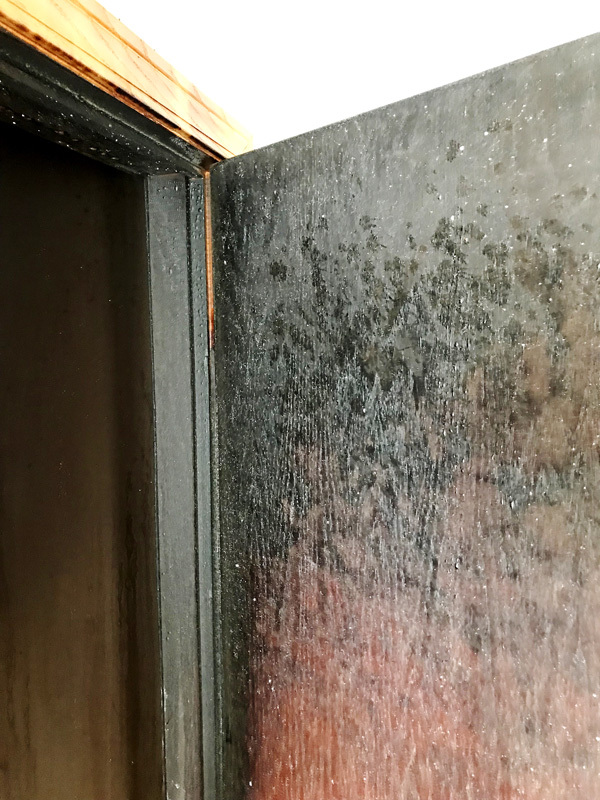 Those unburnt sides of the doors show just how important it is to keep doors closed and why, Wagner believes, kids are taught to check their doors before opening them if they smell smoke. Standish said there are a few steps to ensuring one’s safety if trapped in a burning building. One should check for heat or smoke around the cracks in the door and touch the door and doorknob to see if it is warm or hot. If any of those signs are present don’t open the door. Stay in the room and call for help by phone or from a window. If there are no signs of fire cautiously open the door, and if there is no sudden rush of heat or smoke exit the building. Wagner stresses that the key to this is the closed doors. 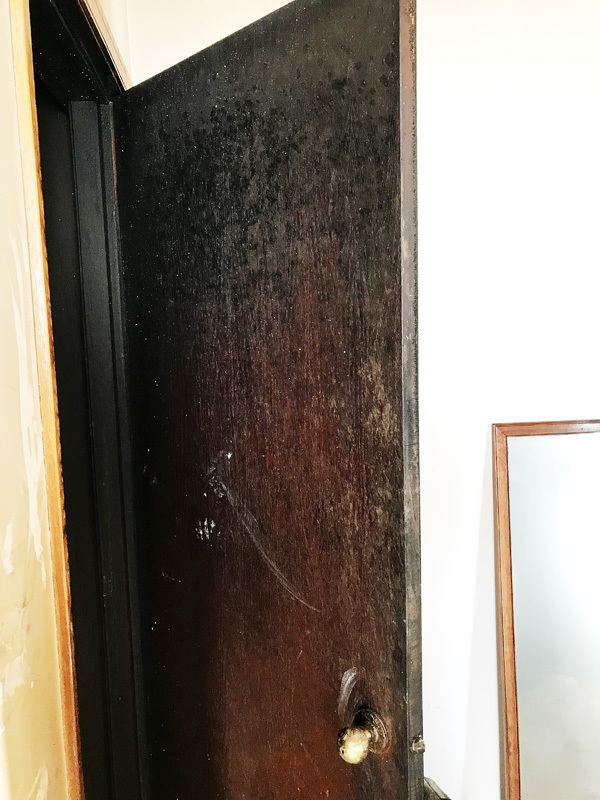 “The closed door bought the most time,” she said which is why she is urging people to close their doors, and not just at night when they go to bed. “It’s even when you leave your house during the day,” she said. Wagner said that just taking those small precautions can make a big difference. “You don’t know where a fire’s gonna start,” she said. “The fact that the people called it in when they did that they were on the lake that day, that they had a cell phone on them that the fire department responded in the timing they did and the fact that my sons door was closed because of our dog bought us the time we needed to not have our garage burn down and not have the two neighbouring houses burn down,” said Wagner. Wagner is grateful to Maggie that because she would eat socks the bedroom doors where closed which saved her scrapbook room and memories. She’s also grateful to the firefighters who worked hard and risked so much to fight the fire. “They did a fantastic job…they could not have done better on my house,” she said.